DuEPublico is the central repository of the Duisburg-Essen University. You have the option to publish the full text version of your documents, in addition to their pure recording in the university bibliography. The documents are digitally preserved on a long-term basis and, in terms of an open access, are made freely accessible worldwide. We suggest to use DuEPublico to publish your document for the first time. Of course, we offer support during the process of publishing. 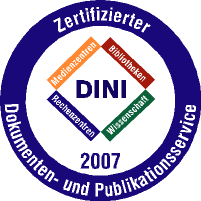 While notifying the Deutsche Nationalbibliothek of your document, we assign a Uniform Resource Name (URN) and, by request, a Digital Object Identifier (DOI). In addition, you can use DuEPublico to make secondary publications accessible, if they are consistent with the German copyright and/or the publishing house’s conventions and author contracts. You find detailed information on first and secondary publications on our Open Access pages.